On February 6, 2018, the SpaceX Falcon Heavy took flight, demonstrating a capacity to lift 60 tons to low Earth orbit while playfully sending a Tesla Roadster on a trajectory that will take it beyond the orbit of Mars. To add to the coup, two of the Falcon’s three booster stages flew back to land gracefully together at the Cape, while the third barely missed pulling off a recovery landing on a drone ship stationed downrange. To understand how extraordinary this accomplishment was, let us recall that in 2009, the Obama administration’s blue-ribbon review committee headed former Lockheed Martin CEO Norm Augustine declared that NASA's Moon program had to be cancelled, because the development of the necessary heavy lift booster would take 12 years and 36 billion dollars. SpaceX has now done that, in half the time and at a thirtieth of the cost. And, to cap it all, the launch vehicle is three quarters reusable. This is a revolution. The naysayers have been completely refuted. The Moon is now within reach. Mars is now within reach. 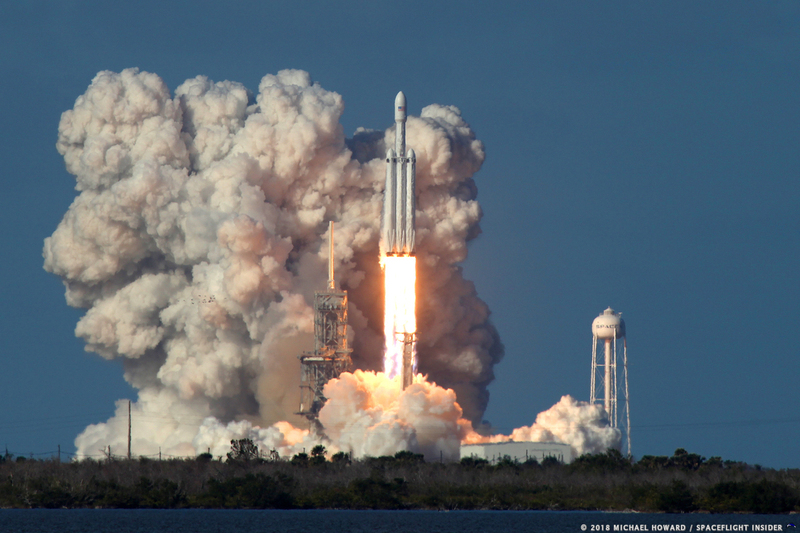 Some may object that the Falcon Heavy, while delivering double to triple the payload to orbit of the competing Delta and Atlas launch systems at one-sixth the per-kilogram price, is still inadequate to support human missions to the Moon or Mars. They are mistaken. While the Falcon’s 60-ton lift capability is only half that of the Saturn V we used to send astronauts to the Moon in the 1960s, it is enough. A rocket that can lift 60 tons to orbit can deliver payloads of 12 tons to the lunar surface, which is sufficient to build a Moon base in modular fashion. If it were up to me, I would send a habitat module and a large solar power system to a highland near the Moon’s South Pole where they would always be in sunlight. From there, the station could beam power for over 100 kilometers, allowing astronauts to access deposits of ice captured in nearby permanently-shadowed craters. The water obtained could be electrolyzed to make rocket propellant, providing astronauts with the means to visit most of the Moon using hydrogen/oxygen rocket-propelled flight vehicles for transportation. Small human Mars exploration missions with two-person crews could be mounted using three Falcon Heavy launches per mission. Two of these would be used to send an Earth Return Vehicle (ERV) to Mars orbit and an ascent vehicle to the surface. The ascent vehicle would make its methane/oxygen propellant out of Mars atmospheric CO2 and permafrost using well-understood chemistry. Once this is done, the third Falcon would be used to send the crew to Mars in their hab module. The crew would land near the ascent vehicle, using their flight hab as their base for a year and a half, after which they would ascend to rendezvous with the ERV that would take them home. This is just the beginning. SpaceX is developing the means to allow them to refuel the booster second stage after it reaches orbit. Once this technology is in hand, the Falcon’s payload to the Moon or Mars will triple, giving it a capability one and a half times greater than the Saturn V. With such a system, the entire inner solar system will be wide open to exploration and development.